Happy Sunday!! Another nice, relaxing day! 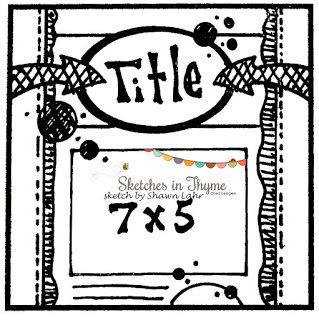 This morning I worked on a page with a sketch from Sketches in Thyme. I made a Mickey Mouse head shaker box, using a few beads, glitter and Mickey body part brads. I flattened the backs of the brads to keep the movement inside the shaker. I love the Mickey shaker box! Fun layout! Thanks for joining us at Sketches In Thyme!